Italy have already secured a top position in Group and face Republic of Ireland on their last group stage match on Wednesday night. This article contains our Italy v Ireland betting preview with predictions, betting tips, enhanced odds, line-ups, streaming links, free bets and no deposit bonuses on the Euros. Italy have already qualified from the group in first place after two convincing wins with conceding against Belgium (2-0) and Sweden (1-0). The Azzurri now take a six-game win streak in qualifying and tournament matches into this clash and they have outscored opponents by a 6-0 margin over their past four games. The likes of Gianluigi Buffon, Giorgio Chiellini, Leonardo Bonucci and Daniele De Rossi will be probably rested as well as Graziano Pellè and Eder up front. The new attacking couple will be formed by Simone Zaza and Ciro Immobile, with Lorenzo Insigne and Federico Bernardeschi other possible options. Manchester United full-back Matteo Darmian is likely tobe deployed at centre-back alongside Angelo Ogbonna and Andrea Barzagli. Republic Of Ireland followed-up an impressive if ultimately disappointing 1-1 matchday one draw against Sweden with a comprehensive 3-0 defeat at the hands of Belgium last weekend, leaving them winless in their past five overall and seven of their past nine games. They have to win here and even that may not be enough to qualify due to their goal difference. The Republic of Ireland have a decent recent record against Italy, having only lost once in their last five meetings with the Azzurri. Furthermore, they could take advantage of the fact that Italy may entirely change their starting XI from matchdays one and two. 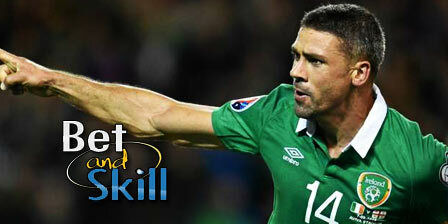 Boss Martin O'Neill could once again be without veteran Stoke City forward Jonathan Walters. He will reportedly axe three of the back four that started against Belgium with Seamus Coleman set to be the only survivor. Robbie Brady is expected to return to left back while Shane Duffy and Richard Keogh will replace Ciaran Clark and John O'Shea in central position. Up front Shane Long could be partnered by Daryl Murphy while Wes Hoolahan will retain his berth in number ten role. Stephen Quinn is another probable new-entry in midfield. Italy (3-5-2): Sirigu, Barzagli; Ogbonna, Darmian; De Sciglio, Thiago Motta, Sturaro, Florenzi, El Shaarawy; Immobile, Zaza. Ireland (4-3-1-2): Randolph; Brady, Coleman, Duffy, Keogh; Quinn, Whelan, Hendrick; Hoolahan; Long, Murphy. "Italy v Ireland predictions, betting tips, lineups and odds (Euro 2016 - Group E - 22.6.2016)"